At this point AngelList is fairly pervasive in the startup/angel ecosystem but not much tactical knowledge is being shared about (1) how to get attention there and (2) results. I’ll lay out the details of our AngelList experience in this post. It’s best to hold off on creating an AngelList profile until you are ready to begin talking to investors. Others have advised that you shouldn’t join AngelList until you have 30% – 50% of your round committed. It’s good for perception and fueling urgency. We had about 30% committed. You can go in and create your profile at any time, just be sure to leave your page UNPUBLISHED for now. There are some other articles that give pretty good advice about to trick out your profile, so I won’t cover that much. 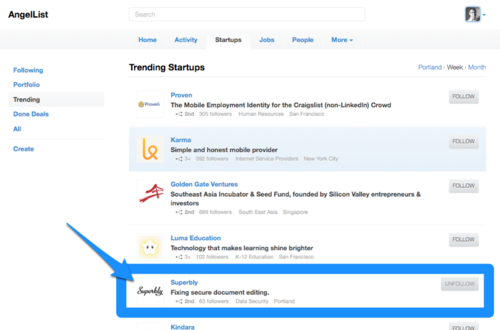 There are a several “levers” you can pull on AngelList that add to your momemtum to trend. This is the person who ‘referred’ you to AngelList. You only get one Referrer. This should be the most influential (on AngelList) non-investor you know. These are people who would ‘vouch’ for you or your company. There’s no limit to the number of references you can have, but 3 to 10 is a good amount. These should also be influential non-investors. You company’s previous investors (double duh). People that follow your company on AngelList. The more the better. Timing is really important as you’ll see. So you want to do some good prep before hand. We started out by making a spreadsheet of EVERYBODY we personally know that has an AngelList profile. Put everybody on there. Once we had our list we went through and determined who would make the best Referrer and References. A personal greeting and sentence or two. If you haven’t talked to the person in awhile, include a brief summary about what your company does. How are things going with ####? I’m going to be in the Bay Area next week. It’d be cool to grab a drink. I’m not sure if I told you about our new company, Glider (formerly named Superbly). It’s basically a document collaboration platform to help companies streamline their contract process. Cruising along pretty well. What’s your schedule like next week? Step 1: Send an email to the person who you want to be your Referrer. Wait to hear back from them. Step 2: Send emails to the people you want to be References and ask if they are willing. Wait to hear back from (most of) them. Step 6: Send individual emails out to everybody else on your spreadsheet asking them to follow/share your profile. Step 9: Post to all mailing lists that you’re a part of that have high numbers of AngelList users. Each time somebody follows you or is added as a referrer/advisor/reference/etc it show up on the universal activity stream and in the user’s activity stream. Got Alex Payne as our referrer. Sent emails to our references (Noah Kagan, Matt Shobe, Mat Ellis, Rick Turoczy, Blake Robinson). Sent personalized direct emails to 60+ of our contacts who we knew had AngelList profiles and asked them to Follow us and/or Share our profile. Sent out an email to the Portland Founders email list asking for advice on how to best take advantage of AngelList and asking for follows. Sent out an email to the Portland Seed Fund alumni list asking for follows & shares. Posted on all our personal and company social networks (Twitter/Facebook/LinkedIn). One of the biggest results was the social proof. During investor meetings there was definitely a sense of urgency they wanted to know who else we were talking too. 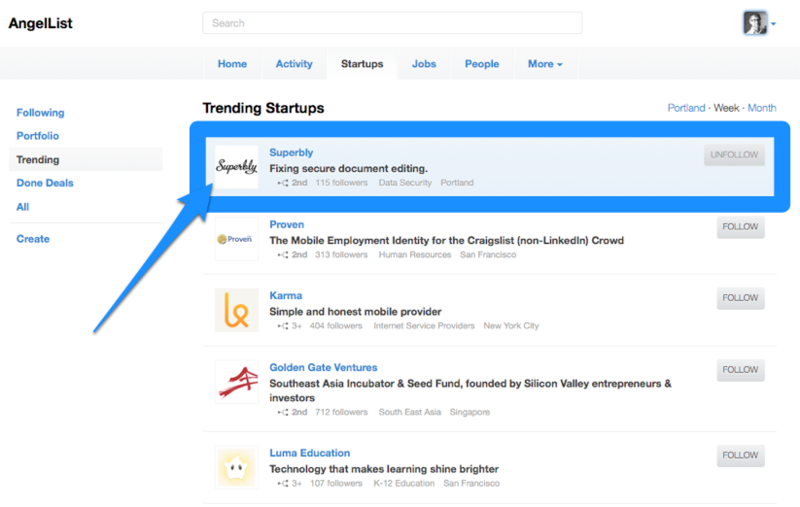 Becoming a Trending Startup on AngelList is very doable, but it takes a concerted effort. This is just one data point, but I’ve been giving this advice for the past couple of months. In fact, LeanPlum was the #1 Trending Startup all of last week having followed most of this method. So, do you have any AngelList secrets? I’d love to hear your results! You can expect to see new posts here each week. Be sure to check back often or subscribe by RSS. Hey Justin, my only question is did you do this before or after you launched your service? Hey Thomas, you should do this when you are beginning to raise money. Some do it pre-launch, some post-launch. Can’t thank you enough for this article! Being a newcomer into this Angel funding stuff, I’m totally lost and reading as much as I can. But your article goes right to the point! Great article – thanks for sharing! We are in the process of putting our application together. Are you available for private mentoring / consulting? Thank you for this terrific information. I am always trying to build my AngelList presence and I will definitely put these tips to work. It would be great to see follow-up articles that add to the knowledge base here. AngelList and other fundraising sites change their formats periodically, so references to new functions will help. I loved your stuff Justin!! Absolutely good job. And to be honest you inspired me. So thank you. One quick question. What about if we had published in our beta and now we are getting ready for the big launch, what effect would that have on our efforts? Do you think we still do have a chance for organic jump or not? I do product stuff (development and product management) and sometimes marketing at startups. I also work on a ton of hobby projects. SeenDB: More Likable Than Ever! Copyright © 2019 Justin's Blog.